Chesapeake Bay Retriever Dogs - The Chesapeake Bay Retriever is a medium sized breed of dog that was developed along the Chesapeake Bay in the U.S.A. It hunts under adverse weather and water conditions, often having to break ice during the course of many strenuous multiple retrieves. The breed was used not only to retrieve the game, but also to sit in the boat and on the wagon when the game was taken to market, in order to protect the load from theft. Thus, the breed is very protective of its people and property. Many owners refer to this breed as "Chessies". Distinctive features of the Chesapeake Bay Retriever eyes that are very clear, of yellowish or amber hue, hindquarters as high or a trifle higher than the shoulders, and a double coat that tends to wave on shoulders, neck, back and loins. This "waterproof" coat feels slightly oily compared to other members of the same family and often has a slight musky odor. Three basic colors are generally seen in the breed covering all shades of brown, red and tan. This breed is also known for their large, and powerful chests; used to break apart ice when diving into ice-layered water while duck hunting or retrieving apples. The Chesapeake Bay Retriever is valued for its bright and happy disposition, intelligence, quiet good sense, and affectionate protective nature, and is a very loving and makes a wonderful companion. 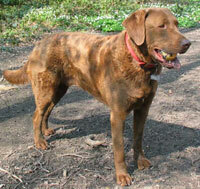 The Chesapeake Bay Retriever is naturally dominant and tends to recognize only one person or family as master. In order to keep the dog from attempting to become the alpha family member, the dog's master should regularly reinforce dominance over the dog by issuing a command such as 'come' or 'sit' at a time when the dog would rather not do so. This information is licensed under the GNU Free Documentation License. It uses material from the Chesapeake Bay Retriever article on Wikipedia.org. 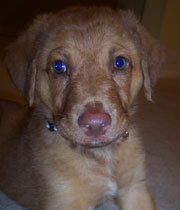 Chesapeake Bay Retriever Dogs - Advertise your kennel puppies and dogs here. Nordom Chesapeakes - Breeders of quality CBR's since 1975 - Bred for field competition/hunting/show companionship. Our Chesapeakes are Birdy, Athletic and tractable.